Lead to a Better life! Expecting? Prenatal Vitamins Got it All! Conceived? This is awesome news!, as we already know that proper nutrition is a must during the nine months or so of pregnancy that’s why your shopping cart should look like a rainbow now. Go for healthy meals from all food groups. Let us be honest and straightforward. It’s relatively difficult to figure it out if you’re taking all those essential vitamins (vital amines) and minerals you and that beauty in your tummy needs. Here comes the role of “best prenatal vitamins.” Today, we are going to discuss this subject in reasonable detail, and within this article, you will be able to learn about the best prenatal vitamins available on the market – over the counter. The Most Important Question; what are prenatal vitamins? The other name for folic acid is vitamin B-9. It plays an important role and helps in mitigating the risk of sping Bifida, congenital disabilities, and anencephaly. The CDC (Center for Disease Control) recommends 400 micrograms (0.4mg) of vitamin B-9 on a daily basis for women at or over childbearing age. So, ensure that the product you are using has at least that much. Iron is essential for pregnant women! CDC recommends 27mg/day and 18mg for pregnant and non-pregnant women respectively. However, you have to be very careful while supplementing your body for Iron. Don’t worry as the best prenatal vitamins are formulated with complete care so to prevent any chance of overdosage. The recommended dose (1300mg/day) for Calcium is same for both the pregnant and non-pregnant women. It is quite essential to make sure that you are getting enough calcium as a deficiency of calcium during pregnancy can result in series consequences. This element plays a vital role in the healthy development of your baby and helps explicitly develop healthy muscles, bones, teeth and a healthy heart. In this part, we are going to assist our readers who face great confusion while choosing the one between synthetic and food-based prenatal vitamins. Let us describe each one of them and discuss which kind of prenatal vitamins are better for you being an expecting mother and why? The following part of this article will also help you understand what are prenatal vitamins and their two major classes available as well. These are the ones offered in different formulations and found over the counter at drug stores. They are created in a laboratory with vitamin isolates extracted from natural co-factors just like phytonutrients – an element that helps your body utilize the vitamin. According to the studies, synthetic vitamins are nutritionally inferior to natural products, and they can also cause digestive issues. Vitamin toxicity is one of the common problems being faced by the woman who keeps themselves with synthetic vitamins. A long-term consumption of certain synthetic vitamins like calcium and vitamin E is tied to kidney stones and DNA damage respectively. Vitamin A in its synthetic form is called Beta Carotene which according to some researchers may inhibit some mechanisms of vitamin A in the body resulting in more vitamin deficiency. In our view, the use of synthetic prenatal vitamins should be avoided as it has many downsides. These are the ones derived from food and not from isolated vitamins. As they come from food, they contain phytonutrients, enzymes and other co-factors making them more absorbable and enriched with a spectrum of nutrition. These prenatal are gentler on the stomach and thus more absorbable. 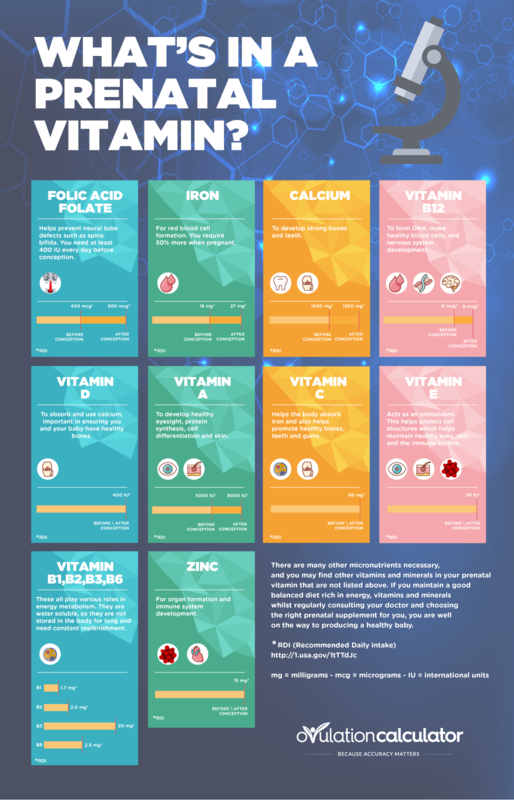 Many reported on synthetic vitamins during pregnancy reported significant improvement from nausea or constipation when switching from synthetic to food based vitamin products. There is one downside to food based prenatal, and it’s their cost and lesser levels of minerals and vitamins than synthetic products relatively. However, they are far more absorbable than their synthetic counterparts, and thus high levels are not necessary. In our view, food-based are the best prenatal vitamins and luckily speaking there are several good products available on the market. Prenatal vitamins come in different forms: soft gel capsule, gummies, and pill. Some moms-to-be might find it difficult, holding down and swallowing a pill when queasy especially. Try it in gummy or soft gel capsule form in case if that`s your situation. Remember, gummy prenatal vitamins seldom contain iron, so do keep a check on this and add an extra iron supplement in case if necessary. Some good products are also available in the form of drops. Don’t worry much about the mechanism of administration as they come with similar effectiveness. How to Choose the Best Prenatal Vitamins? Well, as we already have discussed, food-based ones are the Best Prenatal Vitamins, and they are readily available everywhere over the counter. When shopping for Best Prenatal Vitamins look for Folic Acid, Iron, Calcium and Vitamin D that’s research by the Baby Advisor – Those four primary nutrients that are crucial during pregnancy. Believe us; it will be a bonus if you found a product that comes with omega-3 fatty acids as well. It is a fact that omega-3 fatty acids play a supportive role in the development of fetus`s nervous system and brain. There are hundreds of products available on the market and being an expecting mother you might find it a bit difficult to choose one. Don’t worry and go ahead with these short reviews across different products. MegaFood is a trustworthy vendor offering great products at high-quality standards. Their prenatal vitamins product, “Baby & Me” is higher in vitamin D, comes with a great cross-spectrum of nutrients, and contains vitamin K and several good B vitamins. As far as the minerals are concerned, it`s high in Iodine, Zinc, Iron and other minerals important for pregnant women. Perfect Prenatal® is one of the best Prenatal Vitamins products available as its non-GMO, gluten-free and made from organic items only. It is high in vitamin K, D and minerals specifically Iron. Unfortunately, this product is not up to the RDA mark in Iodine, Calcium, Magnesium, and Zinc and more surprisingly in Folate (perhaps the most important nutrient for pregnant women). It also contains soy which is considered as a high allergen food. However, it includes sprout blend and probiotics which makes it a choice for many moms. Undoubtedly, Rainbow Light is one of the most trusted brands operating in the natural prenatal vitamins market. Prenatal One™ is one of their most popular products and for good reasons. It contains iron twice as far as the most prenatal offer. It is also strong in Zinc, Iron, and Vitamin C and copper. This product also includes probiotics in suitable amounts and counted among gentle ones on the stomach. However, the use of folic acid in this product instead folate is considered as a big issue, and it also contains D2 and not more absorbable D3. The MTHFR defect makes it difficult for the body to convert folic acid and folate into a consumable form – a condition not very good for expecting mothers. The MTHFR defect becomes a concerning issue during pregnancy as it promotes the stacking up of unusable folic acid (from specific prenatal and food items). The growing amount of unconsumed folic acid can cause toxicity and a deficiency of folate. Remember, folate deficiency is not right, and it is associated with some congenital disabilities as well. Don`t worry – there are prenatal blends available specifically designed for women with MTHFR mutation issue and following are two of them! This prenatal blend is an ideal one for to-be-moms with The MTHFR defect as it contains folate in its methylated form instead of folic acid. The methylated folate is comparatively more natural to assimilate than in other types of folate and folic acid. This product contains elevated levels of iron which can be an issue and an irritating one for some moms. This prenatal is said to be formulated by one of the most renowned MTHFR experts. Women who cannot process folic acid due to MTHFR defect can use Optimal Prenatal as it contains methyl folate and folinic acid. Not only is this but it also provides vitamin B12 as adenosylcobalamin – an absorbable form for women with defects related to the MTHFR. When Should I start taking it? If there is any side-effect? Are they good for hair growth? In fact, it is a common misconception as we don’t have any scientific evidence available. We are feeling sorry for being the bearer of this bad news – yet we have to provide our readers with authentic and proven information only. Can the man take them? Yes, they can as it is not going to bring any harm to them. Still, it is not going to be an ideal choice. Men should keep themselves with standard multivitamins formulated for men as they contain optimized amounts of nutrients best suited and altered for men`s needs. Do they assist in getting pregnant? Let it be like this! They will ensure that there are sufficient reservoirs of necessary nutrients available in the body. However, they cannot play any other role, nor they can make you more conceivable. Well, prenatal vitamins are great and we cannot deny their significance. Still, they just cannot replace a balanced diet. Instead, they work like a backup. So, do yourself and your approaching child a favor. Proceed with a well-adjusted food ahead, and for sure you will make a great mother. Don’t forget to keep your body purged with the pregnancy superfoods like Avocadoes, Dates, Liver as they can bring dozens of the nutrients you need being pregnant. Unfortunately, with our industrialized food system and depleted soils, we cannot get everything we need relying on food alone. Which is why supplements and especially the best prenatal vitamins available are so crucial for a healthy and nutritious pregnancy.